At WrestleMania 34, Kevin Owens & Sami Zayn lost their match against Daniel Bryan & Shane McMahon. As a result, Owens & Zayn must remain fired from the SmackDown Live brand. If Bryan and McMahon were defeated, Owens and Zayn would have been reinstated to SmackDown Live. 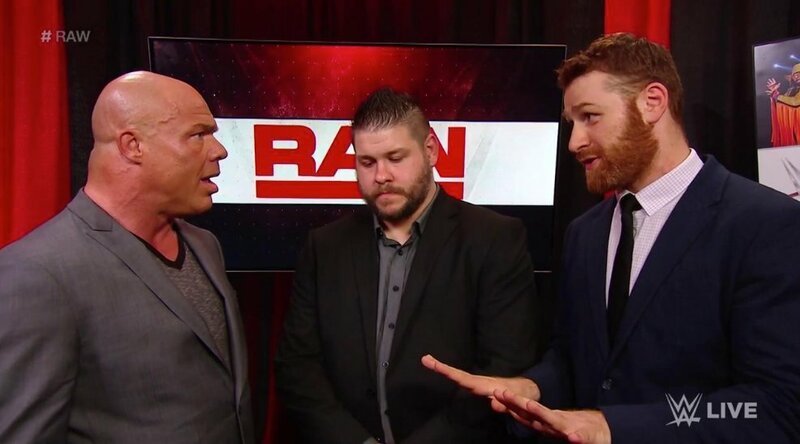 Looking for a job, Owens & Zayn appeared on RAW last night and asked General Manager Kurt Angle if they could work there. It did not take long for Owens and Zayn to betray each other’s friendship and individually state their case for why they should be the one Angle hires. Instead, Angle booked a match pitting Owens & Zayn against each other, with the winner earning the spot on Raw. Owens & Zayn fought to a draw, ref reached a 10 count with both down on the mat. So neither one of them got the spot on the RAW roster.